One of the true classics of American literature, The Wonderful Wizard of Oz has been enjoyed by young and old for over a century. Originally published in 1900, it was the first American fairy tale. Maybe you saw the great movie with Judy Garland and neglected to read the original. This is your chance to follow the adventures of Dorothy and Toto, her little dog, as their Kansas house is swept away by a cyclone and they find themselves in a strange land called Oz. Here she meets the Munchkins and joins the Scarecrow, the Tin Woodsman and the Cowardly Lion on an unforgettable journey to the Emerald City, where lives the all-powerful Wizard of Oz. 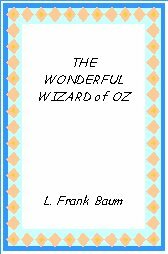 To order click and type “Wizard of Oz” in the body. We will send you the e-book free of charge by return e-mail.